What is it: A five-door hatchback bashing down Gen Y's door. Highlights: Despite its looks and design, the Soul is not a mini SUV, but a front-wheel-drive hatch along the lines of Dodge's Caliber. The Soul entices the younger market with options like bigger alloys and different bodykits, sporty or retro interior trims, bigger stereos, etc etc. To celebrate the Australian premiere of the all-new Kia Soul at the Melbourne International Motor Show, Kia Motors Australia will be displaying five different interpretations of its latest model in a special interactive 'Soul Zone' on the Kia stand. The eagerly awaited Soul marks a revolutionary expansion of the Kia product line-up and redefines the personality of cars, with Generation Y and the young-at-heart firmly in its sights. Soul presents consumers with such a broad selection of styling, comfort and equipment choices, that it redefines the concept of freedom and individuality and creates a new category for the young and young-at-heart. It's a brand new urban car packed full of liberating ideas - a car that challenges consumers to 'free your mind', to build an emotional bond with their new car and to rethink everything they know about Kia. 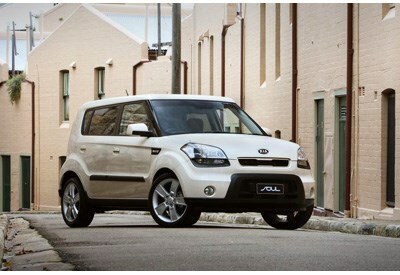 The all-new Soul closely follows the concept first shown to the world in 2006. Kia Motors Corporation's Chief Design Officer, Peter Schreyer, has overseen the evolution of Kia Soul from 2006 concept fantasy to its 2009 production reality. "Conceived in the USA, developed in Korea and fine-tuned in Europe, the Soul will be a breakthrough vehicle for Kia on its journey to be seen as a design-led company and the maker of distinctive cars which consumers aspire to own," said Mr. Schreyer. "Kia Soul is all about creating a car that demonstrates our passion for automotive design, gets Kia talked about the media and the public, and generates an irresistible customer appeal." The Soul also features the trademark Kia 'corporate grille' that first had its Australian premiere on the new Kia Cerato sedan, launched last month and already drawing accolades from the Australian media and buying public alike. The key to the all-new Kia Soul's appeal is its ultimate 'customisability' for young and young-at-heart urban car buyers. With 61 factory and locally fitted options available, no two Souls seen in the street are likely to be the same, thus expressing the individuality of their owners. The new Kia Soul can be whatever you want it to be! Options will include alloy wheels; body-kits; audio upgrades; sports or 'retro chic' interiors; body accents and many other options, all designed to give customers almost infinite possibilities to personalise and individualise their own Soul. • Burner (Black): Go ahead, judge it by its cover! • Diva (Vanilla): Arrive fashionably ahead of your time. • Lava (Orange): Blend out. The only thing it lacks is subtlety. • Mode (White): It's a blank canvas for your individual personality. • Searcher (Green Tea): It'll move you. Even when standing still. When released to the Australian market in early April 2009, the new Kia Soul will be available with a choice of petrol or diesel engines, with manual or automatic transmissions.